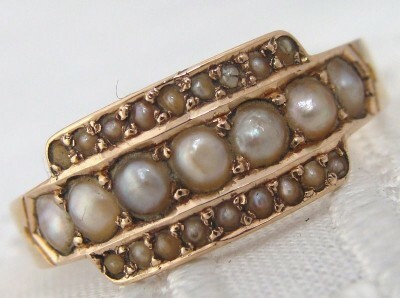 This Antique Deco style ring is Absolutely Stunning in person and in near MINT condition; the pictures do it no justice. A total of 25 genuine pearls are encrusted and pave set within the geometrical setting – so simple yet so elegant. Nearing Mint Antique condition! I cannot see any flaws to the pearls, only a couple of the teeny ones have a crack or chip when viewed under magnification. There is no evidence of repair and no wear to the setting. It is clear it was worn little, if at all. It is resizable, if desired – it looks great on the pinky finger. It comes complete with part of what is most likely its original box, as pictured.